Michael Peevey serves on the advisory board of the Goldman School of Public Policy. 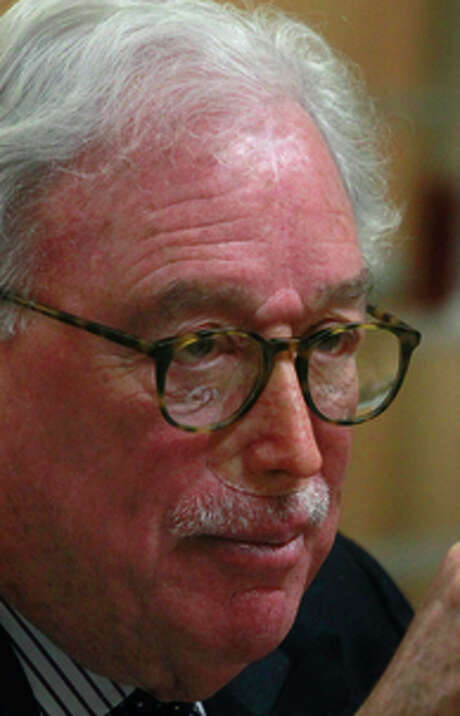 Former state Public Utilities Commission President Michael Peevey — whose home was recently searched by investigators looking into possible corruption at the agency — will be feted Thursday night with a $250-a-plate fundraiser for UC Berkeley’s public policy school. The party honors the 76-year-old former utility executive and commission leader for his “lifetime of service,” but critics have denounced the gathering, citing the troubles besetting the state agency and its lax regulatory oversight record before the deadly explosion of a Pacific Gas and Electric Co. pipeline in San Bruno in 2010. Peevey retired in December, after a year in which the commission became embroiled in controversy over whether officials had improperly collaborated with PG&E on rate-setting cases and other matters. The event Thursday night will raise money for the UC Berkeley Goldman School of Public Policy, where Peevey serves on the advisory board. It is being organized by a San Francisco public relations executive and a former utilities commissioner who now lobbies for PG&E. The gathering at the Julia Morgan Ballroom in San Francisco comes as revelations pile up surrounding e-mails between PG&E executives and top commission officials, including Peevey. State agents who searched Peevey’s home in La Cañada Flintridge (Los Angeles County) on Jan. 27 reported in court documents that they had found notes written on stationery from a hotel in Warsaw. Officials with Southern California Edison, the utility that Peevey used to head, said this week that the notes documented a previously undisclosed meeting between Peevey and a company official over problems at the San Onofre nuclear power plant. Critics say the notes are proof that Peevey secretly brokered a deal to saddle Edison customers with more than $3 billion in costs for decommissioning the plant. The agents who searched Peevey’s home were also looking for evidence of bribery, judge shopping and influence peddling related to rate-setting cases and other matters before the commission, according to a search warrant affidavit. State Sen. Jerry Hill, D-San Mateo, who has frequently criticized the utilities commission, said of the fundraiser, “It’s unbelievable and it’s shameful. It’s an embarrassment to the people of California, especially to the families of the eight people killed in San Bruno, which was due in part to his negligence. Henry Brady, the school’s dean, said Wednesday that the school had never sought to cancel the event. Peevey has a long record of public service, and understandably drew attacks in the 12 years he served as commission president for his stances on controversial matters, Brady said. The fundraiser is being organized by public relations executive Don Solem and by Susan Kennedy, a PG&E lobbyist who formerly served as a utilities commissioner and as a top adviser to Govs. Gray Davis and Arnold Schwarzenegger. Reached by phone Wednesday, Solem declined to comment. Kennedy did not respond to requests for comments. The master of ceremonies for the event is former San Francisco Mayor Willie Brown, now a Chronicle columnist who has lobbied on behalf of PG&E. Among those not invited were San Bruno officials, whose relationship with the commission has been contentious since revelations emerged regarding its lax regulation of PG&E before the September 2010 gas disaster. San Bruno City Manager Connie Jackson called the fundraiser an insult to the disaster’s victims.